which returns a Vector representation of each of the MacroElement s' boundaries, parametrised by the coordinate(s) along this boundary. For instance, in the above example, the eastern boundary of MacroElement 1 is given by the appropriate fraction of the curvilinear boundary; its northern boundary (which coincides with the southern boundary of MacroElement 2) is given by the straight line emanating from the curvilinear boundary, etc. The MacroElement s obtain their boundary positions via member function pointers to Domain::macro_element_boundary(...). Definition at line 71 of file domain.h. Definition at line 77 of file domain.h. Definition at line 84 of file domain.h. Definition at line 96 of file domain.h. Vector representation of the i_macro-th macro element boundary second derivatives i_direct (e.g. N/S/W/E in 2D) at time level t (t=0: present; t>0: previous): f(s). Broken virtual. Definition at line 209 of file domain.h. Referenced by oomph::QMacroElement< 2 >::assemble_macro_to_eulerian_jacobian2(), and d2macro_element_boundary(). Vector representation of the i_macro-th macro element boundary second derivatives i_direct (e.g. N/S/W/E in 2D) at current time: f(s). Definition at line 223 of file domain.h. Vector representation of the i_macro-th macro element boundary derivatives i_direct (e.g. N/S/W/E in 2D) at time level t (t=0: present; t>0: previous): f(s). Broken virtual. Definition at line 182 of file domain.h. Referenced by oomph::QMacroElement< 2 >::assemble_macro_to_eulerian_jacobian(), oomph::QMacroElement< 2 >::assemble_macro_to_eulerian_jacobian2(), and dmacro_element_boundary(). Vector representation of the i_macro-th macro element boundary derivatives i_direct (e.g. N/S/W/E in 2D) at current time: f(s). Definition at line 195 of file domain.h. 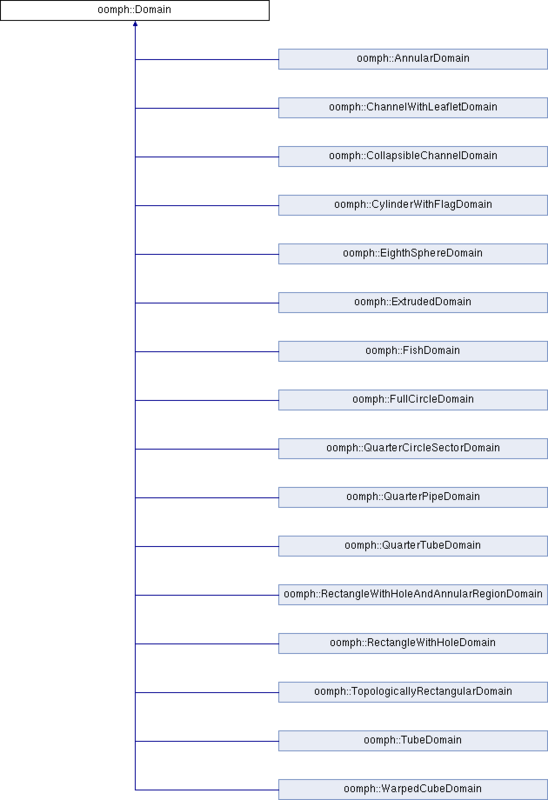 Implemented in oomph::WarpedCubeDomain, oomph::CollapsibleChannelDomain, oomph::QuarterTubeDomain, oomph::TopologicallyRectangularDomain, oomph::RectangleWithHoleDomain, oomph::QuarterCircleSectorDomain, oomph::TubeDomain, oomph::FullCircleDomain, oomph::QuarterPipeDomain, oomph::FishDomain, oomph::ChannelWithLeafletDomain, oomph::AnnularDomain, oomph::EighthSphereDomain, and oomph::CylinderWithFlagDomain. Referenced by oomph::QMacroElement< 2 >::assemble_macro_to_eulerian_jacobian(), oomph::QMacroElement< 2 >::assemble_macro_to_eulerian_jacobian2(), macro_element_boundary(), oomph::QMacroElement< 2 >::macro_map(), oomph::QMacroElement< 3 >::macro_map(), oomph::QMacroElement< 2 >::output_macro_element_boundaries(), and oomph::QMacroElement< 3 >::output_macro_element_boundaries(). Vector representation of the i_macro-th macro element boundary i_direct (e.g. N/S/W/E in 2D) at current time: f(s). Definition at line 144 of file domain.h. Access to i-th macro element. Definition at line 100 of file domain.h. Referenced by oomph::ChannelWithLeafletMesh< ELEMENT >::ChannelWithLeafletMesh(), oomph::Missing_masters_functions::construct_new_external_halo_master_node_helper(), oomph::Multi_domain_functions::construct_new_external_halo_master_node_helper(), oomph::EighthSphereMesh< ELEMENT >::EighthSphereMesh(), oomph::ElasticRefineableQuarterPipeMesh< ELEMENT >::ElasticRefineableQuarterPipeMesh(), output_macro_element_boundaries(), oomph::QuarterPipeMesh< ELEMENT >::QuarterPipeMesh(), oomph::RectangleWithHoleMesh< ELEMENT >::RectangleWithHoleMesh(), oomph::RefineableEighthSphereMesh< ELEMENT >::RefineableEighthSphereMesh(), oomph::RefineableFullCircleMesh< ELEMENT >::RefineableFullCircleMesh(), oomph::RefineableQuarterTubeMesh< ELEMENT >::RefineableQuarterTubeMesh(), oomph::RefineableRectangleWithHoleMesh< ELEMENT >::RefineableRectangleWithHoleMesh(), oomph::RefineableTubeMesh< ELEMENT >::RefineableTubeMesh(), and oomph::RefineableTwoDAnnularMesh< ELEMENT >::RefineableTwoDAnnularMesh(). Number of macro elements in domain. Definition at line 107 of file domain.h. Referenced by output_macro_element_boundaries(), oomph::RectangleWithHoleMesh< ELEMENT >::RectangleWithHoleMesh(), and oomph::AnnularDomain::~AnnularDomain(). Definition at line 90 of file domain.h. Definition at line 113 of file domain.h. Definition at line 122 of file domain.h. Output all macro element boundaries as tecplot zones. Definition at line 157 of file domain.h. Definition at line 167 of file domain.h. References i, macro_element_pt(), nmacro_element(), and oomph::MacroElement::output_macro_element_boundaries(). Vector of pointers to macro elements. Definition at line 237 of file domain.h. Referenced by oomph::AnnularDomain::AnnularDomain(), oomph::ChannelWithLeafletDomain::ChannelWithLeafletDomain(), oomph::CollapsibleChannelDomain::CollapsibleChannelDomain(), oomph::CylinderWithFlagDomain::CylinderWithFlagDomain(), Domain(), oomph::EighthSphereDomain::EighthSphereDomain(), oomph::FishDomain::FishDomain(), oomph::FullCircleDomain::FullCircleDomain(), macro_element_pt(), nmacro_element(), output(), oomph::QuarterCircleSectorDomain::QuarterCircleSectorDomain(), oomph::QuarterPipeDomain::QuarterPipeDomain(), oomph::QuarterTubeDomain::QuarterTubeDomain(), oomph::RectangleWithHoleDomain::RectangleWithHoleDomain(), oomph::TubeDomain::TubeDomain(), oomph::WarpedCubeDomain::WarpedCubeDomain(), oomph::AnnularDomain::~AnnularDomain(), oomph::ChannelWithLeafletDomain::~ChannelWithLeafletDomain(), oomph::CollapsibleChannelDomain::~CollapsibleChannelDomain(), oomph::CylinderWithFlagDomain::~CylinderWithFlagDomain(), oomph::EighthSphereDomain::~EighthSphereDomain(), oomph::FishDomain::~FishDomain(), oomph::FullCircleDomain::~FullCircleDomain(), oomph::QuarterCircleSectorDomain::~QuarterCircleSectorDomain(), oomph::QuarterPipeDomain::~QuarterPipeDomain(), oomph::QuarterTubeDomain::~QuarterTubeDomain(), oomph::RectangleWithHoleDomain::~RectangleWithHoleDomain(), oomph::TopologicallyRectangularDomain::~TopologicallyRectangularDomain(), oomph::TubeDomain::~TubeDomain(), and oomph::WarpedCubeDomain::~WarpedCubeDomain().